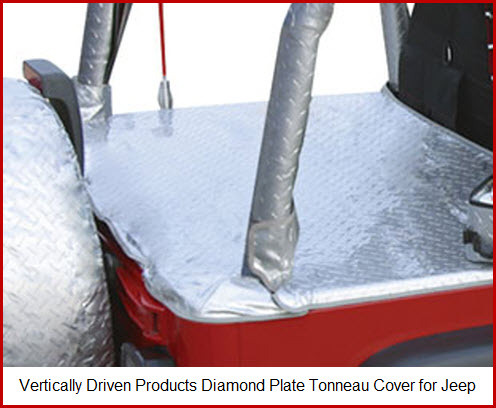 Vertically Driven Products makes the tonneau cover you need for your Jeep. Vertically Driven Products has been manufacturing Jeep accessories under the VDP label since 2002. Tip: Protect the bed of your Jeep with a set of universal absorbent mats. They'll reduce moisture, dirt and mold/mildew smells in the truck bed area. For many years prior to 2002 VDP made Jeep accessories for branding by other companies. So you’ve got a company with a lot of Jeep experience and love here. VDP makes one basic soft tonneau cover for the various Jeep models. It’s not full of a lot of features, but is relatively simple to install and is inexpensive. Here’s some detail on VDP’s soft tonneau cover offering for Jeep. Also check out the rest of the VDP product line.